Many perceptive homeowners know that the appearance of the exterior of their home makes the first impression on any visitor or passerby. That first impression may actually be more important than the interior. It makes a statement of the general quality of the home as perceived from the curb or by those coming to say hello. As important as the exterior of the home is in creating a positive and uplifting environment for visitors and the general public, many may neglect one of the most important aspects of their home’s visual appeal: the driveway. The first thing you see when you step out of your car should have a look and feel of permanence and beauty. When your driveway is made from Authentic Cobblestone, that lane of entry makes an inviting and aesthetically pleasing statement to all who happen by, or are specifically invited in. If you are considering an upgrade in appearance and function for your driveway or courtyard, you should consider cobblestone. Satisfy your curiosity about the numerous Authentic Cobblestone options available through REALGOODS Company. 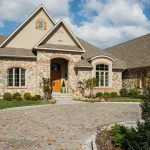 While considering a quality cobblestone pavement may seem daunting at first, we have compiled an informative overview of everything cobblestone and answers to the questions you may have to alleviate any concerns. What are my options? How do I make the best choice? Cobblestones come in a wide variety of shapes, colors, and sizes. With proper guidance from our years of experience in helping our customers to plan their projects and meet their budgets, we will help you focus on the sizes and colors most suited to achieving your vision so you are not overwhelmed by the choices. When considering cobblestone, you can narrow down your options by determining your budget and your time constraints. If your budget is tight, gray granite cobble is your most economical option. It is best to order your cobblestone well in advance, and schedule them to arrive shortly before installation. If however, stone selection and delivery need to happen very quickly, we can typically provide the best combination of value and expedited logistics to provide domestic, imported, or antique cobblestone for your project. Once you determine your square footage, budget, and construction schedule, your choice of cobbles will be primarily based on aesthetics and personal tastes and preferences . Let’s break it down though. Size: Cobblestones are fabricated in a number of different standard sizes. The most common sizes are 4x4x4” Cubes, 4x4x8” Mini Block, 5x5x9” Regulation Block, and 10x7x4” Jumbo Block. These common sizes are all available in several thinner varieties that are less than full thickness, but provide the same look as the thicker stones. Thinner versions of the Cubes include 4x4x3” and 4x4x2”. The Mini Blocks can also be configured in 4x8x3″ and 4x8x2”. The Regulation Blocks are available in 5x9x4”, 5x9x2”, and 5x9x1.5”. The Jumbo Blocks are made in two thicknesses: 10x7x4” or thin jumbos which are 10x7x3”. One of the primary advantages to the thinner varieties is that you can increase the square footage that you can fit on the truck for delivery. This spreads out the cost of freight over more stone coverage, saving significantly on freight cost. You can also choose a three size combination (6x9x3”, 6x6x3”, and 6x3x3”) which provides a more random appearance, and has become very popular for the look it provides and the fact that it’s one of the more economical cobblestones available. Those three sizes are also available individually. All cobblestone dimensions are nominal +/- average sizes, and can vary by as much as one half an inch. Custom sizes are also available but may take longer to produce and deliver. Color: Other than the most widely used color of gray, cobbles can come in rose (pink), buff (tan/beige), yellow, and black. The Rose, Buff, Yellow, and Black in all the sizes mentioned previously except for the 4x4x8” and the 5x9x4”. Antique Cobblestone: If you really want to add some old-school charm to your home, consider purchasing Antique Cobblestone. While they are generally more expensive than new cobbles, the antique cobbles are coveted for their worn appearance and patina. Antique Cobblestones also have a story to tell. They hold historical value from the people of bygone generations and their horse drawn carriages with iron clad wagon wheels that created the beautiful patinated surface. Antique Cobblestones are not as widely available as new cobbles, as they are difficult to reclaim and have become more scarce as the years go by. Generally, they come in regulation and jumbo sizes, with some occasional cubes and other variations. Reclaimed Antique Cobbles also tend to have more variability in size from one stone to the next, which is another part of what makes them attractive. Domestic antiques are usually mixed gray in color, but those imported from Europe have more color variety. Advantages: Not only is cobblestone beautiful and functional, it will also last for thousands of years. While asphalt may be more smooth to drive on, the sound and feel of real Authentic Cobblestone is uniquely welcoming and the stone definitely stands the test of time. 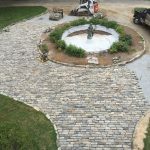 Cobblestone requires little to no maintenance and really the only issue you may run into with cobbles is an occasional stray blade of grass, or a stone may have to be reset if it sinks in or raises up; however, both are easily remedied. Cobblestone is an all natural time tested standard, that is durable, dependable, and aesthetically pleasing. For as long as mankind has had the need to build roads, we have been building those roads out of cobblestone. Although other paving materials are in use today, the cobblestones of old have always, and will continue to outlast all the others.